Madison City Council adopts guidelines for former Oscar Mayer site | Vandewalle & Associates, Inc.
MADISON, WI (EXCERPTS FROM MADISON.COM): After a nearly yearlong study, the Madison City Council adopted a report outlining broad goals for the former Oscar Mayer site on the city’s north side. 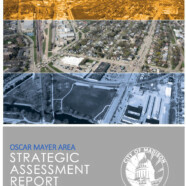 The report was prepared for the City of Madison and Oscar Mayer Strategic Assessment Team by Vandewalle & Associates and Equity by Design. For nearly a century, the Oscar Mayer facility occupied the 72-acre site at 910 Mayer Ave. and manufactured hot dogs, bologna and other lunch meat. It also held a key property in the north side neighborhood and in the region and fostered a “sense of pride and social cohesion” still present today. “During its nearly century in operation, the Oscar Mayer facility has had an immeasurable positive economic impact on the community in the many well-paying jobs it provided, as well as the businesses that were supported by the company, its employees and their families,” the report states. Following a restructuring by its parent company Kraft Heinz, the facility closed in June 2017 and is being developed by Reich Brothers Holdings and Rabin Worldwide. Due to its importance economically, socially and physically, the city is emphasizing the future reuse of the site bounded by Sherman, Packers and Aberg avenues in its “big picture” analysis. The current vision for the site, now called OM Station, includes a mix of commercial and industrial uses. Read the full article here.